Video has emerged of a group of teenagers viciously attacking a 12-year-old middle school student in California and running off with his sneakers. 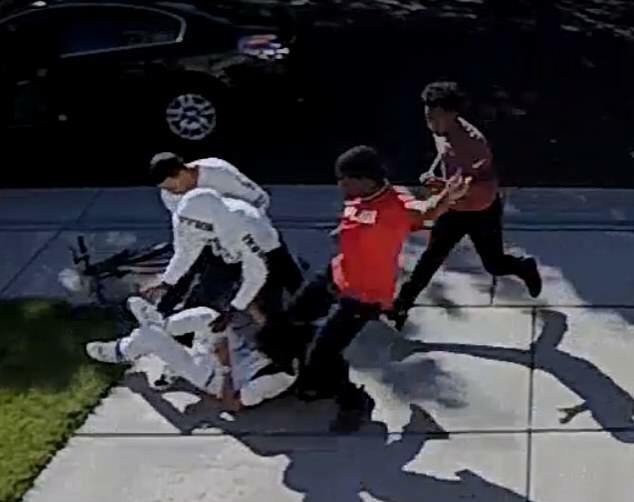 The victim, who has asked to not be identified, is seen in the video outside a home in Elk Grove talking with one of the suspects while sitting on his bike at 3:30 pm on Friday. 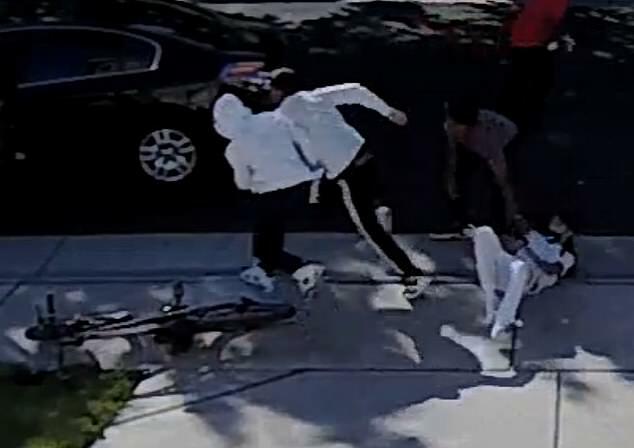 Three other teenagers can then be seen sprinting at full pace towards the boy, joining the other suspect as they shove him off his bike and begin to punch, hit and kick the defenseless victim. The entire incident lasts only 10 seconds, and right at the start one of the suspects is seen delivering a kick to the victim’s head while running at the boy. The victim then does his best to cover his body as the group of boys relentlessly beat him about the head and torso. Then, they can be seen quickly going through his pockets and pulling his Air Jordans off his feet. It all ended just as quickly as it began, with the boys suddenly rushing away from the victim and jumping into a waiting car, that then speeds off. A bystander can be seen approaching from the top of the screen at that point, though it is unclear if they were aware of the incident. Police received the video from the private residence and quickly posted it to social media. That proved to be all they needed to apprehend the four males, who were all booked into juvenile hall on Monday. ‘Elk Grove Police Department officers and detectives have been investigating the crime throughout the weekend,’ reported the police in a statement. Those four suspects are all 16 or 17 years old according to police, and they are facing charges of robbery and conspiracy. One of the teenagers also faces an additional charge of assault with a deadly weapon. The case is still under investigation according to police.